Be the first to share your favorite memory, photo or story of Mrs. Mary Nell Crew Gann. This memorial page is dedicated for family, friends and future generations to celebrate the life of their loved one. 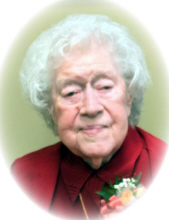 Mrs. Mary Nell (Crew/Gann) Burch, age 100, a life long resident of Paulding County passed away Sunday, January 20th at Paulding WellStar Nursing Center in Dallas, Georgia. Mrs. Burch was born on September 26, 1918 to Mr. William Howard Crew and Nell Hitchcock Crew. She was married to Mr. Thomas Leonard Gann for 42 years prior to his death. She was later married to Mr. Glenn Gray Burch, Sr. for 21 years until his death in 2012. Mrs. Burch or Mrs. Gann as she was affectionally known, taught school in Paulding County for 38 years. She began her teaching career at age 17 at the New Hope School. She taught at other schools in the county and completed her teaching career at Matthews Elementary School. She was an active member of the Dallas First United Methodist Church. Mrs. Burch was preceded in death by her husbands, Thomas Leonard Gann and Glenn Gray Burch; parents, William Howard and Nell Crew; and brother, William Howard (Billy) Crew. She is survived by her sister-in-law, Margaret Smith Crew; nephew Stevan (Linda) Crew; niece Suzy (Brett) Cannon; great nieces, Cassidy Daybell, Megan Strong and Joanna Crew; great nephew, Jonathan Crew; and step-children: Glenn (Robin) Burch, Willa Jane Freeman,Brenda (Dwight) Kees, and Luanne (Kenneth) Miller; step grandchildren and great-grandchildren also survive. Funeral services for Mrs. Burch will be Friday, January 25, 2019, 2:00 p.m. in the chapel of Benson’s Funeral Home. Visitation will be from 12:00 - 2:00 p.m. prior to the funeral service. Stevan Crew and Brett Cannon will officiate. Internment will be at Dallas City Cemetery. In lieu of flowers, donations can be made to the Dallas Cemetery Fund. To send flowers or a remembrance gift to the family of Mrs. Mary Nell Crew Gann Burch, please visit our Tribute Store. "Email Address" would like to share the life celebration of Mrs. Mary Nell Crew Gann Burch. Click on the "link" to go to share a favorite memory or leave a condolence message for the family.